It’s not a professional networking, support or singles groups, nor is it a matchmaker service, social network or advocacy organization. It is not about self-empowerment or Ethiopian cooking. It is all of the above, and a lot more. Meetup seems to have some of everything for everybody. One would be hard pressed to find their personal interests or age group missing from the Meetup website, meetup.com. It lists hundreds of groups to join based on location, the commonality of your interests and age group. Members can gather to participate in and enjoy activities of mutual interest with new friends. In East Dallas and White Rock, Meetup groups are abundant. Recently some of those have been patronizing White Rock area establishments including Chubby’s, B.J.’s and the Barley House. On Saturday, April 21, the “60+ Singles Having Fun” and the “Fun-Loving Singles over 50” groups met at Lake Highlands’ Lone Star Roadhouse where the Pit Pops performed. Before an event, you must join the group by going online to its website or Face Book page and register with basic information. Most groups also have Facebook pages. With robust activities scheduled, you can stay as busy through Meetup as you choose. Meetup groups cover a plethora of interests. Some of those have an unexpected theme, like “Childless by Choice Couples,” “Lower Greenville Posse,” and “25-35 Introvert Ladies Circle.” There’s even a ukulele Meetup in Garland. Meetup groups are quite specific in their niche with ages and interests. International Meetups, along with the U.S., are comprised of 3,700,133 members registered in 4,329 Meetup groups internationally. Those generally fall into categories of cultural exchange, language and culture, language exchange and many more that are like U.S. Meetup groups. Michael Gadberry is an East Dallas resident who joined Meetup in 2008. He helps other organizers arrange local events, and particularly music outings. Thursday, April 26 a group had brunch at Bass Pro Shop in Garland — a groups’ regular mid-week brunch. 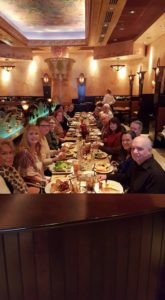 The groups frequently patronize Ozona and Cheesecake Factory, especially for brunch. For additional information about Meetup and to join a group, visit Meetup.com or Face Book.